These foliage and fruit diseases are caused by different species of Alternaria. On vegetables, these fungal pathogens most commonly damage crucifers, cucurbits, onion, pepper, potato, and tomato. 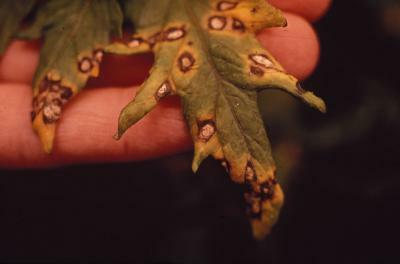 Accepted names of the diseases vary, depending on the host affected, but it is commonly referred to as early blight on potato and tomato, purple blotch on onion, and Alternaria spot on crucifers and cuucrbits. Alternaria affects many herbaceous flowering plants as well. On leaves of tomatoes and mums, usually spots with concentricrings develop. On Calendula species, Alternaria causes small reddish-purple spots. On other hosts, the most characteristic symptom is brown or dark spots on older leaves. The circular to angular spots enlarge until they are about 1/4 to 1/2 inch in diameter and soon develop dark, concentric rings or ridges, giving a target-like appearance. Lesion growth may bestopped by major leaf veins. Spotted leaves soon turn yellow, wither, and drop. Leaf spots are usually covered with dark, velvetyspores (conidia). The fungus may also cause depressed but similar lesions on potato tubers and around the stem end and shoulder of tomato fruit. Fruit lesions are often covered with spores (conidia). The pathogen survives in infected plant debris left on the soil surface or buried in the soil and on or in the seed. Under favorable conditions in the spring, the fungi produce spores that are carried by wind and splashing rain. Secondary disease cycles can occur as long as the weather remains favorable. Spore production and secondary infections are favored by heavy dews, rainy conditions, and temperatures between 66 and 73 F.
Crop rotation and clean tillage (for example, plowing) help reduce the risk of disease by reducing the amount of primary inoculum (spores) in the immediate area. The Alternaria fungi tend to be weak pathogens, so limiting crop stress such as poor fertility, drought, insect damage, and heavy fruit also reduces disease severity. Fungicide applications can effectivley control Alternaria diseases of vegetables.